With the cold weather comes a desire to bundle up inside with a bowl of hot soup, or if we have it our way, homemade ramen. Packed with fantastic flavor, tender noodles, and warm chicken broth, it’s hard not to love a soup recipe like this. Ramen, a popular Japenese dish, is traditionally made with bright, yellow wheat flour noodles. While you might think the noodles are made with eggs upon first glance, the yellow hue can actually be attributed to an alkaline mineral water that’s used to make the noodles called kansui. And while these noodles served in broth are delicious on their own, what makes ramen the truly irresistible and exciting dish that it is are all the wonderful toppings. 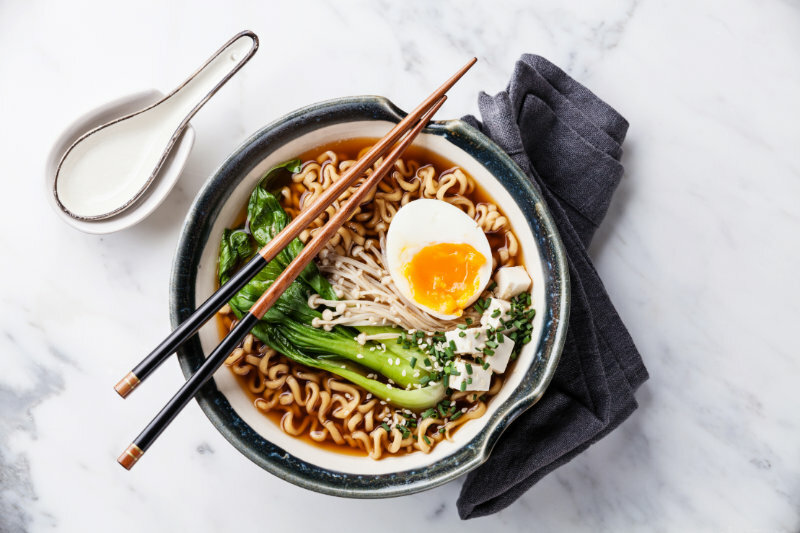 Meat slices, bean sprouts, mushrooms, and eggs are just a handful of the hearty and flavorful toppings you’ll find on a bowl of traditional ramen. For this homemade ramen recipe, you’re going to top the ramen off with chicken slices, shitake mushrooms, eggs, and scallions. It’s a simple recipe that can be made in under an hour, which is pretty quick for homemade ramen. Feel free to garnish your homemade ramen with fresh herbs like cilantro or add a little heat with some jalapeno slices. To make this homemade ramen recipe even speedier, use store-bought rotisserie chicken for your chicken slices on top. Preheat the oven to 375°F. Add a generous pinch of salt and pepper to both sides of the chicken. Add the butter to an oven-safe skillet and place the skillet on the stove over medium heat. Once hot, add the chicken (skin-side down) and cook the chicken until the skin is golden brown. Flip the chicken over and again cook until golden brown. Transfer the skillet to the oven and allow the chicken to roast for 15 to 20 minutes until it's cooked through. Place the chicken on a plate and cover with a sheet of foil until ready to use. Add the oil to a large pot over medium heat. Once hot, add the garlic and ginger and sauté for a minute. Pour in the soy sauce and mirin, then stir to combine together. Pour the stock in, cover the pot with a lid, then bring the broth to a boil. Remove the lid and lower the heat a little bit so that the broth is just simmering for about 5 minutes, uncovered. Add in the dried mushrooms, stir, then let the mushrooms cook in the pot for 10 minutes. Season the broth with salt, to taste. Meanwhile, fill a small pot with water and bring to a boil over high heat. Once boiling, carefully add in the eggs and cook for 8 minutes for a soft, yet set yolk. Run the eggs under cool, running water until they're cool enough to handle. Peel away the shell and slice the eggs in half, lengthwise. Slice the chicken into thin slices and chop the scallions. Add the ramen noodles to the boiling water that the eggs were cooked in, and cook for a few minutes until tender. Divide the noodles among two large bowls. Add the sliced chicken and ramen broth to each bowl, then top with the fresh scallions and soft-boiled eggs.